North Coast Health Improvement and Information Network (NCHIIN), is a California non-profit providing both health information exchange and care improvement in Humboldt county. It has a staff of dedicated and experienced information technology and quality improvement professionals focusing on improving the health of the people of Humboldt. NCHIIN connects health and social and community providers to improve the health of community members using electronic technology while maintaining patient privacy and data security. Health Information Exchange (HIE) supports care givers and care quality by providing immediate information to providers in both an efficient and cost effective manner. Community members may receive care in settings across our county and HIE allows for the coordination of care based access to appropriate information across the community and care givers. NCHIIN provides infrastructure and supports projects for community care improvement with a focus on broad community involvement and collaboration. This continues the work of the Humboldt IPA, a partner in the Robert Wood Johnson initiative, Aligning Forces for Quality, Humboldt. Over the course of that initiative, the IPA and now NCHIIN staff supported projects in quality metrics, primary care practice performance, patient self-management, shared decision making and improved care for high utilizers of hospital emergency departments. Continuing projects include support for convening health and community leadership on important issues. 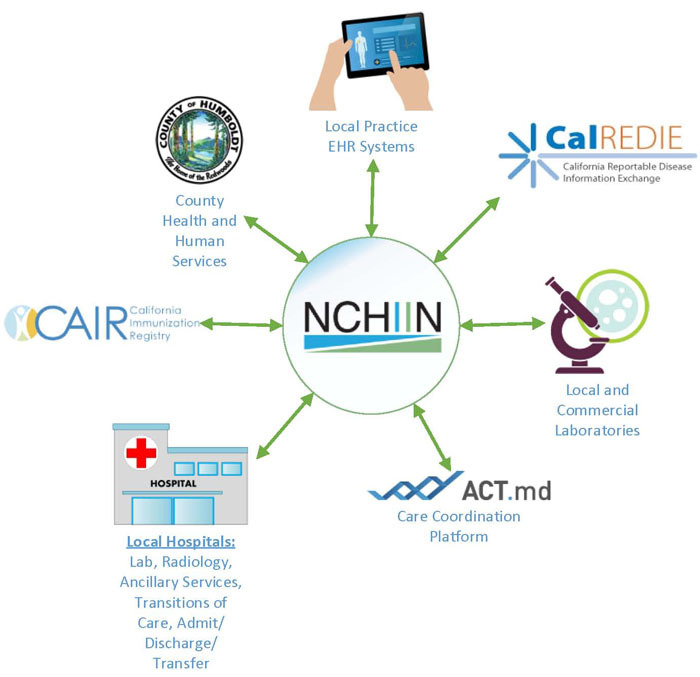 NCHIIN has a particular focus on the combination of information exchange for health improvement across sectors – social care, medical care, behavioral health, justice, education and more, and support for care coordination.